These duchess sweet potatoes add a little pizzazz to your plate, but they are really simple to make. 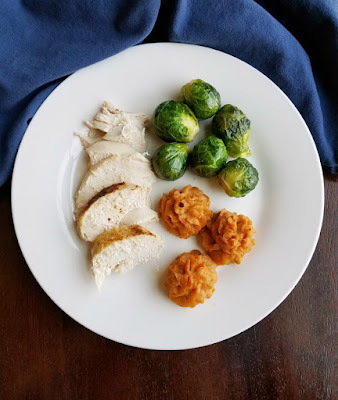 They would be a fun way to change up your Thanksgiving or Christmas meal, but are delicious any time! Fancy up your sweet potatoes without much effort! These lovely duchess sweet potatoes make your dinner plate look nice and they taste delicious. Nobody has to know how easy they were to make. They would be perfect for a fall dinner party, Thanksgiving or just because! Do you guys like sweet potatoes? My husband could definitely go without. He usually humors me if I make them, but skips them at Thanksgiving. I, on the other hand, love them. I love sweet potato fries, roasted sweet potatoes, baked sweet potatoes, sweet potato casserole. You name it, I probably like it! I wanted to try something a little bit different, thinking maybe I would find the perfect thing to bring that husband of mine over to my side. 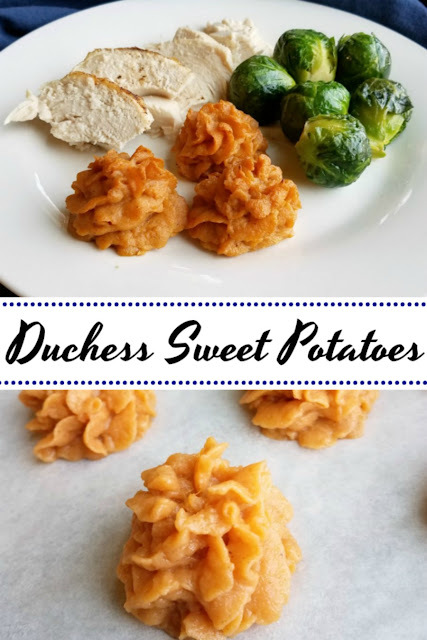 So, I thought it would be fun to make a duchess potato version of sweet potatoes! You get some slightly crunchy bits on the edges and soft, pillowy sweet potato on the inside. What's not to love? I am a busy mom though. I work a full time job, chase a kid who is full of enerfy and have to make dinner in the few minutes in between. So, starting with sweet potatoes that need to be peeled and boiled didn't seem realistic. In traditional duchess potatoes, you'd start with whole russets and turn them into mashed potatoes. A little piping and baking later and you have something new and fancier than you had before. I envisioned doing something similar with the sweet potatoes, but didn't want to spend quite that much time and effort. But where there is a will, there is a way! I knew just the thing to save most of the time and effort would be to use canned sweet potatoes. It worked like a charm! Just drain them and give them a mash. Mix in a few quick ingredients, spoon them into a piping bag and "Voila!" magic is born! This shortcut method makes these quick enough to make on a weeknight and fancy enough to serve to guests. 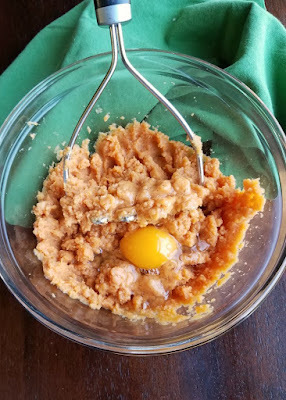 They would be a fun twist to your classic sweet potato side on Thanksgiving or would be great alongside a ham as well. I don't think they made my husband a sweet potato lover, but he did eat a couple. I'll take that as a win for now and accept the challenge of still working to convert him! Make sure you mash the sweet potatoes really well. They are easier to pipe if there aren't lumps to block the tip. Don't want to spice them with cinnamon? Try some chili powder instead! Don't want to spend the whole dinner party in the kitchen? Mash and mix the mixture ahead of time. Then all you have to do is pipe and bake them when it's dinner time. Have fresh sweet potatoes? Just peel and boil them until they are soft enough to mash! Preheat oven to 350 F and line a baking sheet with parchment paper or a silicone baking mat. Mash together all ingredients until smooth and uniform. Spoon into a piping bag with a large star tip. I too love sweet potatoes but not my hubs. 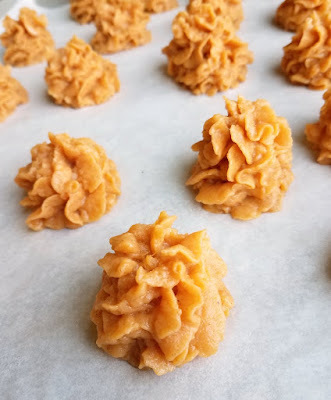 I like this easy and fast recipe to make them. Too funny! Our hubbies need to get with the sweet potato program! Thanks for stopping by Julie! Oooh, these are so beautiful! I've never made Duchess potatoes but they are so pretty! Thank you, they really are easy too. Especially if you start with the can rather than the whole potatoes! They are easy and fun! Thanks so much for stopping by Rue! These look fantastic! What a great presentation :) I have to try this! You've done it again! I was looking for a delicious side dish and yours look amazing! I love duchess potatoes, genius to use sweet potatoes! Pinned! I can not wait to try this! How can you not love sweet potatoes?!? I'm with you - I'll eat them ALL the ways. And these are so beautiful - I can't wait to try them! They definitely would be a lovely addition to a Thanksgiving spread. Thanks for sharing! I love sweet potatoes, too. These sound quite tasty. What a great idea to use the canned ones as a shortcut. It definitely saves a lot of time in the prep work! So cute! LOVE this idea. I happen to love sweet potatoes too. I hear you on being a busy working mom. I'm right there with ya friend! Of course this would be your beautiful post C! I've always wanted to try matching dutchess potatoes, thanks for giving me a terrific excuse to do so! :) These looks so elegant! They are so much fun to make and serve! I hope you love them! Delicious! They look so perfect! My favorite sweet potato shortcut is to use the microwave. That does really cut down on the time too! You could very easily start with microwaved sweet potatoes and scoop out the flesh. Maybe that's what I'll do next time! Thank you! They certainly dressed up the plate! Oh my, these look too beautiful to eat! Who needs holiday decorations with a presentation like that ?! 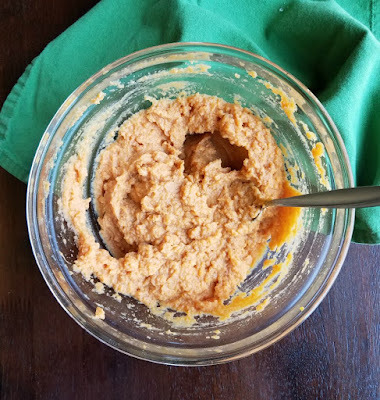 Thank you for sharing this easy recipe with us at Snickerdoodle Sunday. Pinning! Thank you so much! They really are easy to make and made an otherwise humble dinner seem a little extra nice. 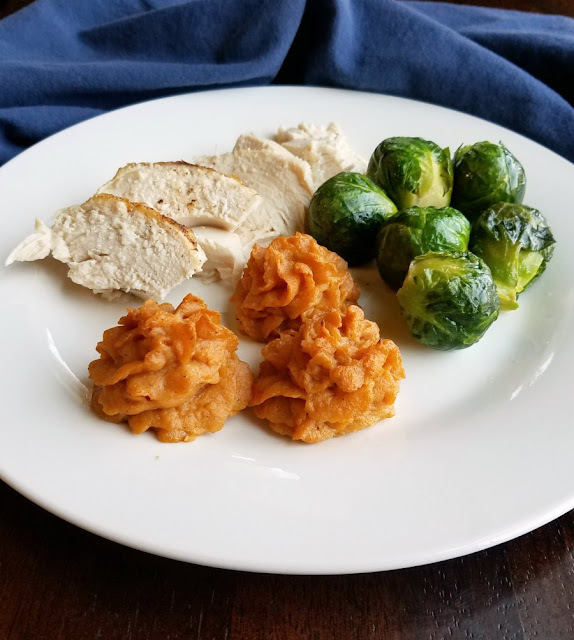 Thanks Carlee for sharing this delicious and easy sweet potato recipe with us at Cooking and Crafting with J&J. These are just adorable! Love them! They sound delicious too! Thank you, we really enjoyed them! Hi Carlee, wanted to stop back over to let you know that your recipe will be featured at the next Snickerdoodle Sunday! Hope you'll join us - party starts Saturday @ 5pm ET. Thank you so much! I will be there for sure! I love these Carlee and will be featuring them this week! Yum!! Can't wait to try!! Thanks for sharing on My 2 Favorite things on Thursday!! Hope to see you again this week! Pinned! Thank you so much Elaine! I hope you are having a great week! Wow, these look yummy! And they'd be so fun to serve at Thanksgiving! Thanks for sharing at Merry Monday, hope to see you again next week! Thank you! They would be so pretty on your Thanksgiving table. Thanks for hosting! I looooooooooooove sweet potatoes, and these are so cute!! Thank you so much! I love them too, it is one of the foods that I can't understand why people don't like them. Oh well, more for us!! It is a fun way to dress them up a little bit! Thanks for hosting! Oh, I definitely love sweet potatoes, these look amazing! Thanks for sharing at What'd You Do This Weekend?! Thank you! We really enjoyed them! Thanks for hosting! These sounds so mouth watering. Think I'll be giving these a try. I hope you love them! It is a fun way to dress up a sweet potato. I love sweet potatoes and I'll take any your husband doesn't want! I'm definitely trying these soon! I do too so I am not at all offended when he doesn't go back for seconds of sweet potatoes. More for me! I almost always go cinnamon but now I want some with chili powder as well. I hope you love them! I love cinnamon in almost anything, and I'm thinking that sweet potatoes with cinnamon would be fabulous. Thank you for sharing. You should totally give them a try! I've been craving potatoes all week...these so need to happen in my kitchen!!! I love Duchess potatoes but have never made them with sweet potatoes. What a great idea! 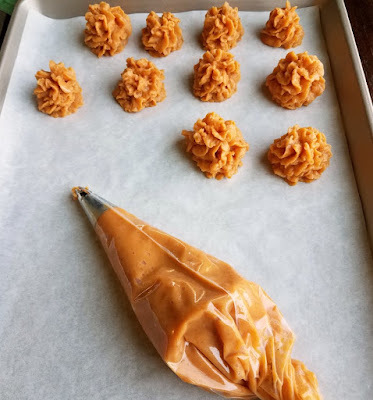 They are so delicious and easy to make, I hope you give them a go! I love how easy you made this! I love sweet potatoes also. Grumpy used to say he hated them. Then I made them mashed one day and he completely changed his mind. I think he was used to just getting it placed in front of him baked when he was a kid and he preferred a regular baking potato. :) I'll have to give this a try, they are perfect for the holidays! 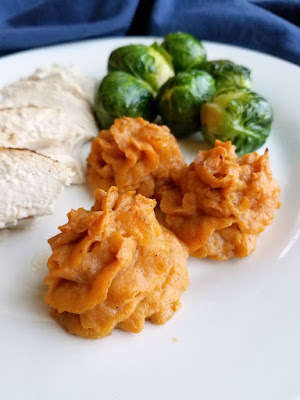 I need to see if my husband would go for mashed sweet potatoes! My Irishman husband is all about white potatoes too, but I love sweet potatoes. These are so creative and beautiful! What is it about our husbands?! Thank you! Still loving these gorgeous little potato mounds of deliciousness! I love these cute little bite-sized sweet potaotes! I would even serve these as an appetizer! They would be a fun appetizer!